A lot of confusion ... And I'm not sure everyone is speaking of the same thing. Just checking to make sure I get all sides of this clear. It's an interesting topic. Also, I believe Sonam just said he believes otherwise. The question was/is about the difference between live and recorded forms. If neither time nor space matters that means there is no difference. Also, as Pero mentioned, oral and symbolic forms convey the direct one, since both oral and symbolic can be recorded without any problem, again, a recorded Dzogchen transmission is as good as a live one. I explained there are different forms of time in Nirmanakaya and Sambhogakaya but not in Dharmakaya and DI operates in all 3. Also I said there has to be i) intention of master ii) Doing it at the same time & iii) getting into the state, for it to be two-way & interactive, otherwise while listening to a recording none of the above apply and he could be in the toilet anyway. Secondly you mis-equate the qualification of space with time as your own dogmatic innovation with no proof except your own mental requirement. One, space, is a question of scale while the other, time, is regarding the dimensions, not scale, ie: going back or forth in time as opposed to current which is required. Current planet and current time equate perfectly in unison. Thirdly I explained how someone in a courtyard at the back of thousands getting lungs from speakers without seeing the lama inside the packed temple is no different than listening on a computer speaker at the same time. Again you provide no logical reason why the two are different. You go on to again innovate falsely that giving DI/Lungs to large groups is only one way as he could not possibly interact with so many. That is your mental fabrication. The group can get into the 'state of the guru he creates for that event'. You are making your own little funny rules based on nonsense. I say nonsense because you accept half the axioms at work and then dismiss the rest based only on what you can currently accept within your current mental models which are limited and false. You can not force reality into those. This is illogical. If you accept a one-to-one transmission as truly two-way, you would be called cuckoo by someone like Dawkins anyway. You can not accept half of it and then invent your own funny little rules based on your current limitations. What you describe here is only Astus's fantasy system. If it is beyond time-space it is always "at the same time" of no-time, so there's no difference between live and recorded. 1- That is your own little non-scientific & non-tantric self-invented pet theory of time. 2) There are many exotic new theories of time within astrophysics, many opposing each other. 3) There will be different ones after a 1000 or a million or billion years of progress, all different theories to current ones or your little personal vague ones. 4) Even if any correct ones are finally discovered in totality, could be by definition impossible, it would only apply to parts of Nirmanakaya. You can not fit the scientific world (current inaccurate near caveman version or ultimate one after billions of years if it exists) or the tri-kaya one into your idiosyncratic quaint little personal model. If you have needs to grasp that peculiar model and other funny little ones you have invented and keep changing, then there is no way to progress within Vajrayana empowerment system not to mention Dzogchen which is at the highest level beyond causality and time at the dharmakaya level while working within causality-time following the real rules, not personal little imaginary ones, within the two lower kayas. Sönam wrote: again, a recorded Dzogchen transmission is as good as a live one. ... I did'nt say so. Just say that there is a perspective where there is no need to be in the same time frame. Said too it's fare not easy, not for our levels, but was refering to mahasiddhas or tertrön connections ... please do not make a too easy jump! This is an incorrect conclusion. The direct transmission cannot be recorded at all, so how is a recording as good as a live one? A recording cannot give you a direct transmission, only a live teacher can. edit: Also, I don't believe time doesn't matter. At least for most of us. Perhaps if you already had some kind of realization it wouldn't matter, though I doubt it. Pero wrote: This is an incorrect conclusion. The direct transmission cannot be recorded at all, so how is a recording as good as a live one? A recording cannot give you a direct transmission, only a live teacher can. Now we're going in circles. Direct transmission is that both student and teacher are in the same state and the same time. To bring a student to that state oral and symbolic methods are used and just because a teacher is in the state doesn't make the student attain in. Also, the state itself is not bound by space nor time, so being synchronous doesn't make sense. As you say, it is not "direct transmission" that is recorded but the methods that bring students to the realisation and that realisation is essentially the transmission. Based on these I ask why would a live teacher be necessary. The main point is the distinction of realisation and method where the method is perceivable but the realisation is not. If you say there is still a need for a live teacher there must be some error in the above reasoning. Astus wrote: Now we're going in circles. Direct transmission is that both student and teacher are in the same state and the same time. To bring a student to that state oral and symbolic methods are used and just because a teacher is in the state doesn't make the student attain in. Everyone gets it, but not everyone "gets is", get it? Because everyone got it they can use methods like semdzin or rushen to deepen their knowledge and if they didn't "get it" they can use them to "get it". As you say, it is not "direct transmission" that is recorded but the methods that bring students to the realisation and that realisation is essentially the transmission. Based on these I ask why would a live teacher be necessary. The teacher is not necessarily in that state all the time. So if you listen to a recording, who knows what the teacher is doing. Without the teacher there cannot be a direct transmission. I'm repeating myself but I'm not sure how to explain it otherwise to you. Pero wrote: The teacher is not necessarily in that state all the time. So if you listen to a recording, who knows what the teacher is doing. Without the teacher there cannot be a direct transmission. I'm repeating myself but I'm not sure how to explain it otherwise to you. OK, the teacher has to be in the state for the transmission. Why? What difference does it make from the perspective of the student who either gets it there or not, perhaps realises it months later without the presence of any teacher. Why is a teacher needed there? Is there no explanation? Just because? I already told you, every student gets it. They just might not be able to "understand" it at that time. But surely that question is valid regardless of whether the transmission or event is an electronic one or not. That scenario you sketch can, and no doubt does, happen in a more regular "face-to-face" meeting? I'm not sure that the question takes the discussion on the electronic transmissions any further. Pero wrote: I already told you, every student gets it. They just might not be able to "understand" it at that time. What do they get if they don't know about it? How is that different from saying that everybody has buddha-nature it's just they don't realise it? Getting something means there was something missing - but buddha-nature is already perfect so they can't be missing that. What people don't have is realisation and introduction to rigpa is supposed to be that, seeing original awareness. If they don't see it there what is it they still get? mindyourmind wrote: But surely that question is valid regardless of whether the transmission or event is an electronic one or not. That scenario you sketch can, and no doubt does, happen in a more regular "face-to-face" meeting? I'm not sure that the question takes the discussion on the electronic transmissions any further. Might be, still, the question is about the electronic form because it can be both live and recorded and it shows no difference from the perspective of the viewer. That does happen, but it's like a flash. You might not realize it or even if you do it doesn't last. Soon after mind arises again and then you're left in doubt. Pero wrote: That does happen, but it's like a flash. You might not realize it or even if you do it doesn't last. Soon after mind arises again and then you're left in doubt. How does that qualify for transmission? People get shocked naturally in their daily lives. Also, there are the so called gaps between thoughts one could realise any time. But there is no recognition, no awareness of awareness on its own, so no realisation. In a face-t-face situation, can you really say that the viewer will always be able to pick up everything? My point about the lesson about "reality" remains. We treat a face-to-face meeting as "real", and an electronic one as seemingly less "real". Is that justified? Pople may get shocked naturally in their daily lives, but there is no Dzogchen teacher around. In any case shock is not the transmission. It is also not awareness of awareness. I'm afraid that I can't explain it any better, this is the limit of my ability and knowledge I guess. mindyourmind wrote: In a face-t-face situation, can you really say that the viewer will always be able to pick up everything? My point about the lesson about "reality" remains. We treat a face-to-face meeting as "real", and an electronic one as seemingly less "real". Is that justified? A good topic but I don't see yet how it pertains to this discussion on transmission. Perhaps if we take into account the possibility of visionary and dream transmissions. But then we just have lot of different settings without defining the relationship between teacher and student. It could be also added that infinite buddhas transmit the complete teaching all the time. You are wasting everyone's time with this question. 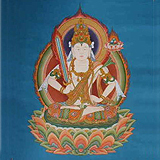 Dzogchen is a Vajrayana system. The Guru is indispensable. If you want transmission, you must get it from a Guru. Live.